BUFFALO, N.Y. and NEW YORK – The University at Buffalo (UB) has unveiled HOK’s dramatic design for its new School of Medicine and Biomedical Sciences building on the Buffalo Niagara Medical Campus. The seven-story medical school will bring 2,000 UB faculty, staff and students daily to downtown Buffalo and, at more than 500,000-square-feet, will be one of the largest buildings constructed in Buffalo in decades. HOK’s design features two L-shaped structures linked to create a six-story, light-filled glass atrium that includes connecting bridges and a stairway. Serving as the building’s main interior “avenue,” the atrium will be naturally illuminated by skylights and two glass walls, one along Washington Street and one at the terminus of Allen Street. The building, which HOK is designing for LEED Gold certification, will have a facade clad with a high-performance terra-cotta rain-screen and a glass curtain wall system that brings daylight deep inside. Incorporating the NFTA Allen Street transit hub into the medical school’s ground floor provides convenient mass transit access, furthering the development of a sustainable, vibrant community. 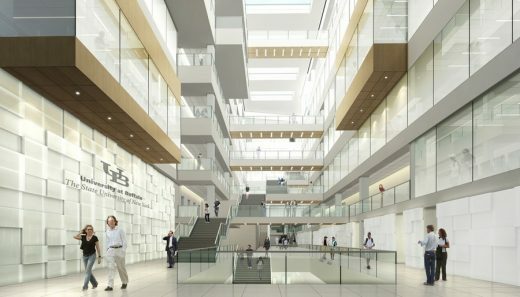 The new medical school will help the university achieve objectives critical to the UB 2020 strategic plan: creation of a world-class medical school, recruitment of outstanding faculty-physicians to the university and transformation of the region into a major destination for innovative medical care and research. The building’s first two floors will house multipurpose educational and community spaces for medical school and community outreach programs. A second-floor bridge will link to the new John R. Oishei Children’s Hospital and the Conventus medical office building under construction along High Street adjacent to UB’s new medical school. The third, fourth and fifth floors of the medical school will feature core research facilities and approximately 150,000 square feet of state-of-the art research laboratories. The sixth floor will house some of the country’s most advanced specialized medical education facilities, including an expanded patient care simulation center that will feature the Behling Simulation Center currently located on UB’s South Campus. It also will house a surgical simulation center where medical students can conduct surgeries in a simulated operating room. A robotic surgery simulation center will train students and physicians in remote control surgery technologies. The medical school’s administrative offices and academic departments will be located on floors three through seven. The seventh floor will house gross anatomy facilities. “From the new school’s active learning environments to the highly flexible research laboratories supporting multidisciplinary teams of investigators, the design supports a range of global trends for the design of academic and research facilities,” said Bill Odell, FAIA, HOK’s director of science and technology. The $375 million medical school is funded in part by NYSUNY 2020 legislation. Groundbreaking is scheduled for September 2013 and construction is expected to be complete in 2016. HOK’s Science + Technology group has designed medical schools and research laboratories for Florida State University, the University of Alberta, Washington University in St. Louis and The Commonwealth Medical College in Scranton, Pa. The firm served as lead designer for The Francis Crick Institute’s cardiovascular and cancer research center in central London and won an international competition to design the Ri.MED Biomedical Research and Biotechnology Center in Palermo, Sicily. HOK is a global design, architecture, engineering and planning firm. Through a network of 24 offices worldwide, HOK provides design excellence and innovation to create places that enrich people’s lives and help clients succeed. In 2012, for the third consecutive year, DesignIntelligence ranked HOK as the #1 role model for sustainable and high-performance design. NEW YORK – After winning a global design ideas competition, HOK has been selected to design the new University at Buffalo (UB) School of Medicine and Biomedical Sciences on its downtown campus. Competition finalists included Pelli Clarke Pelli Architects and Cannon Design, Rafael Vinoly Architects with Foit-Albert Associates, and Grimshaw and Davis Brody Bond. Located at the center of the region’s emerging bio-sciences corridor, this new transit-oriented medical school development will anchor a lively, urban mixed-use district on campus and bring 1,200 students, faculty and staff downtown. With the goal of fostering collaboration and interdisciplinary care, the new academic medical center will create connections that allow students, faculty, biomedical researchers and clinicians to move easily from classroom to bedside to lab. “Building a new medical school is a once-in-a-lifetime opportunity for our university and region, and a critical step in evolving the Buffalo Niagara Medical Campus into an academic health center on par with those of Pittsburgh and Cleveland,” said Michael E. Cain, vice president for health sciences and dean of the School of Medicine and Biomedical Sciences. UB’s selection committee cited HOK’s experience designing some of the world’s highest profile and most innovative health sciences facilities. HOK designed the acclaimed King Abdullah University of Science and Technology (KAUST) in Saudi Arabia and recently won an international competition to design the Fondazione Ri.MED Biomedical Research and Biotechnology Center in Palermo, Sicily. The firm also served as lead designer for the University of Chicago’s William Eckhardt Research Center and the Francis Crick Institute’s cardiovascular and cancer research center in central London, which will be Europe’s largest center for biomedical research and innovation. HOK’s experience includes designing medical centers for Ohio State University in Columbus, Florida State University, the University of Alberta, Washington University in St. Louis, the University of Central Florida, The Commonwealth Medical College in Scranton, Pennsylvania, as well as Northwestern Memorial Hospital in Chicago and LA County + USC Medical Center in Los Angeles. The proposed $375 million medical school, funded in part by NYSUNY 2020 legislation, is a key component of the UB 2020 plan for academic excellence, which is intended to benefit students, faculty, staff and the Western New York community. “This new medical center will become a catalyst for further development in downtown Buffalo and Western New York, and support the convergence of technology and research that will transform the practice of medicine,” said Jim Berge, AIA, principal-in-charge for the project and HOK’s director of science and technology in New York. Reflecting UB’s sustainability and climate-impact reduction goals, HOK will design a highly sustainable building and target Leadership in Energy and Environmental Design (LEED) Gold certification. Groundbreaking for the medical school is scheduled for fall 2013 and construction is expected to be complete in 2016.